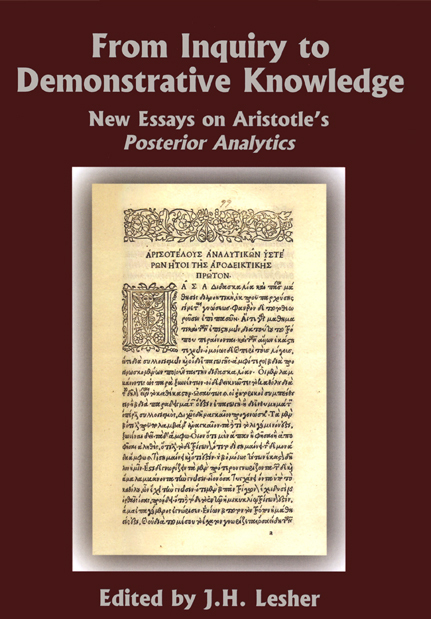 Aristotle’s Posterior Analytics is regarded as ‘'one of the most brilliant, original, and influential works in the history of philosophy', a work that 'determined the course of philosophy of science- and to some extent of science itself- for two millennia' (Jonathan Barnes, Aristotle's Posterior Analytics [Oxford 1975], xiii). Nevertheless the work poses may challenges to the scholar. These original essays by distinguished scholars seeks to resolve many of these challenges. Contributors: David Bronstein, Allan Gotthelf, James G. Lennox, J.H. Lesher, Mariska Leunissen, Richard McKirahan, C.D.C. Reeve, Gregory Salmieri, Gisela Striker, Miira Tuominen.